It has been a year since we purchased the van, which makes it our Vanniversary! In light of this celebration, I did the ice bucket challenge. No, I didn’t. I mean, the ice bucket challenge did happen, but it wasn’t to celebrate the Vanniversary, it was out of pure necessity. More on that later. For the Vanniversary, we took the little Sprinter out for a spin. Just a little road trip from the mountains of northern Oregon, down and around to the hill country land of central Texas. In average temperatures of 100 degrees. With only a simple air conditioner unit, we built from a cheap ice chest and a $5 fan, to keep us cool. More of the sweat dripping details on that trip (including the ice bucket challenge) here. If you haven’t been following our Sprinter Van, you’re in luck, here’s a quick sum up to bring you current…. About a year ago The Husband, and a stack of cash, boarded a plane to Arkansas. The owner of an empty 158wb, high top, Mercedes Sprinter would be waiting to pick him up. An older model, empty inside, with custom dings and excessive miles, but at a realistic price that made the idea of building it, and the dream of endless travel seem possible. 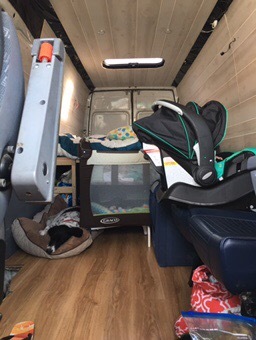 Just a month before finding the van, we welcomed our first bundle of joy, and were convinced a van could totally simplify this new world of baby. 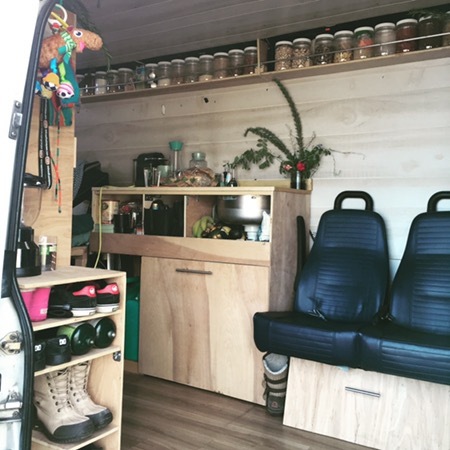 A van could keep this adventurous nomadic life (that we love so much) alive. We threw all our eggs into that basket, not knowing exactly where it would take us, or if it would even work out. Existing in that moment, all our thoughts hopeful, nearly tasting the adventure to come, and wanting out of this suburban lifestyle asap. We refused to fall into that comfort zone of 8-5, responsible car driving, garage full of stuff we don’t use, average lifestyle. It wasn’t for us. The goal was to finish the build, and be on the road by Christmas. Miscalculating the length of time that would be required on research (and taking care of a newborn), December was already here and quickly slipping through our fingers. If we were still going to make Fynlie’s first Christmas a beach-front Christmas, and actually get out of this house before our renters moved in, it was intervention time. 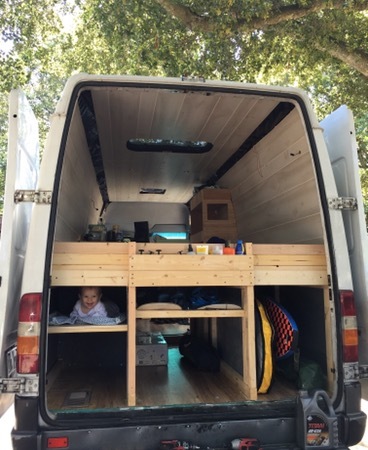 We’d leave with the build as is, and pack as many tools and materials that could reasonable fit in the van. Random cuts and sheets of wood were stacked under the memory foam we planned to sleep on. Materials, and collapsible IKEA boxes of our belongings ended up in a hodge podge of nonsense under the bed. Anything that wouldn’t fit went into the garage, stacked in disarray around the truck that would stay parked with the house. We pushed the button to close the garage door, and didn’t look back. As ready as we were going to be, baby in her seat, puppy snoozing, sun setting, we locked the door to suburbia and turned the key to the van. “iiiii-rrrrr-vroom-shhkaa-mmm” We looked at each other, The Husband turned off the engine and opened the hood. Damn it. We did finally make it out, and baby got her first Christmas beach front. And as a bonus high-5 to me, I was able to fit into my holiday skirt. 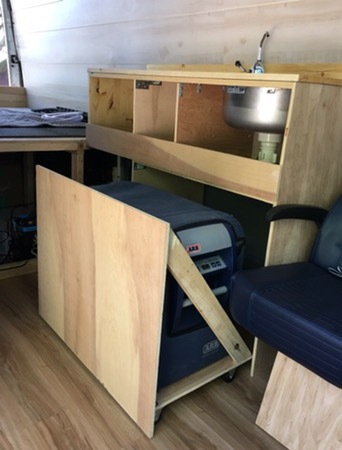 With only the basics completed (solar, insulation, flooring, bed frame, window shades) the conversion continues on the road in parking lots, camp sites, and friends houses. 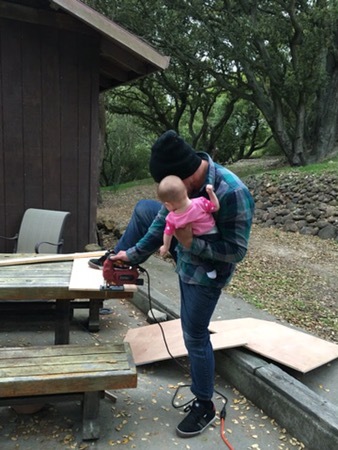 Nevermind the power tool noise coming from campsite #63. Keep walking, nothing to see here, just building out the van. No one said a thing about this in Oregon, but I can only imagine the scene that would of took place if we tried that in California! So many rules, so many people. 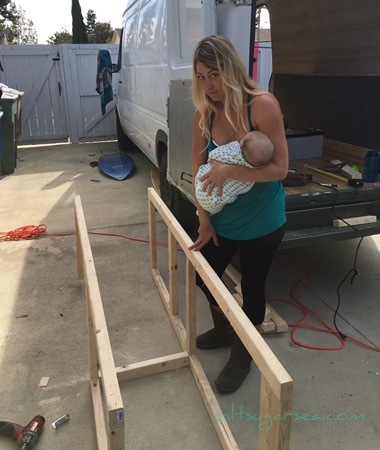 …into this awesome design, with custom his & hers snowboard shelf, headboard, wetsuit (or baby) storage, and surfboard storage. More pictures and details on the under bed storage re-design here and here. Spring seemed to be coming early, and we hadn’t even made it to the mountains yet. It was time to move. 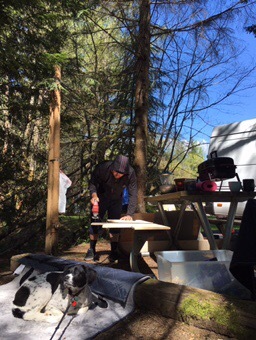 The Husband widdled us a kitchen (all by hand, out of 1 piece of wood), complete with pull out ARB Fridge/Freezer, and hand pump sink connected to two 6-gallon water jugs, for fresh and grey water. He halfway enclosed temporary shelves, to get our kitchen supplies out of boxes, and free up some space under the bed. A smaller sink may have been more practical, but a big sink was on my “want list”, and since I let the oven dream die (for now) the sink was in. 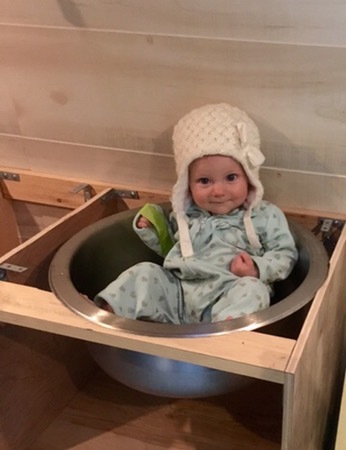 1 super deep, bar style basin sink, big enough to hold a 7 & 1/2 month old baby! 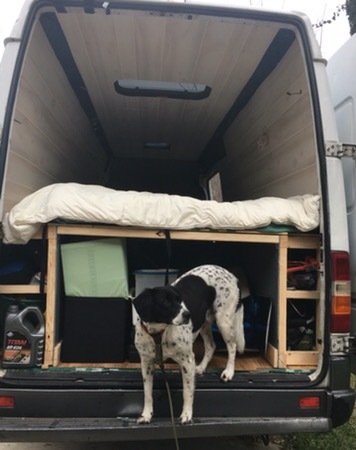 To off-set the conversion cost, that was now exceeding the initial cost of the van, we used Airbnb to rent our suburbian home while living rent free in the van. Not knowing how this whole thing would go with baby on board, we agreed 3 months would be a reasonable amount of time to do the test run. As we neared our 3rd month of #vanlife, baby seemingly happy, we opted to test the waters of extending this sabbatical. As it turned out, our renters were enjoying our home as much as we were enjoying being away from it, and happily took the opportunity to extend their stay through June. Just like that, the adventure continued. We moved to the snow. Once in Oregon, #vanlife simplified. 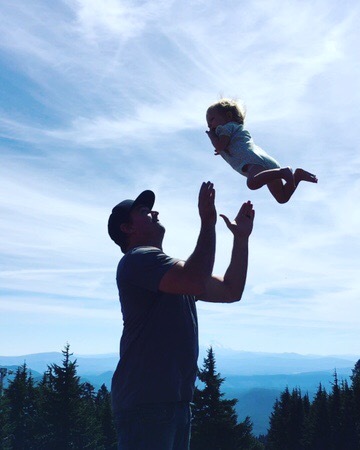 We purchased a Thousand Trails Membership for $425 that gave us access to multiple campgrounds throughout Oregon for an entire year. Comparable in price to a cheap gym membership for 1, this gave all 3 of us a place to shower, swim, workout, use wifi, and even camp with hook ups if we wanted. With a heated indoor pool, baby was able to enjoy daily swim time, even in the cold. The Mt Hood Thousand Trails is just 15 minutes from Mt Hood Timberline Ski area, which offers a Spring Season lift pass at a ridiculous bargain price of only $99 for all of March, April, and May! So that’s living expense of $425/ year and 3 months of snowboarding for $99/ person. Yeah, we like Oregon. Most of the snow turned pretty slushy by May, leaving only 1 or 2 higher lifts open for riding, but there was still plenty to explore. We finally came to a reasonably functional point in the build, with enough shelves of storage, a shoe rack and even a baby bunk bed shelf. Home! We floated towards the beaches, explored some waterfalls, lakes, and forest hikes until that familiar twing of wanderlust kicked in again. We were missing warmer oceans and souther California started calling us back in. We opened the calender to see about renting our home out longer and immediately got new tenants. Could it be possible? 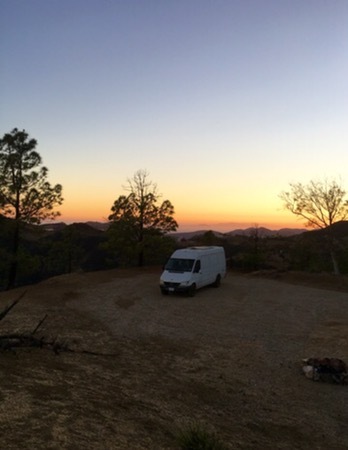 Could we really keep living in the van and traveling about? At the moment it seemed we could. We paid friends to clean house and stock supplies with an order from target.com, mow the lawn and spray for critters, and take care of a few repairs. We were acquiring a full staff to keep this adventure going, and not making any profit. Although, we weren’t really loosing money either, which we reasoned as a ‘pro’ to keep this wandering project going into month 7. Now officially Summer, beach camping turned considerably more crowded and we took up an offer from a neighboring camper to explore some undeveloped land above Leo Carillo state park in Malibu. A welcomed break of quiet. A peaceful stillness you only find in nature, far away from the business of plans and to-do lists. It’s a daily whirlwind of chasing wifi, seeking surf or snow, converting the van on the road, and showing baby the world. Up with the morning sunshine and down with the moonlite, there is rarely idle time, but that was the idea of this lifestyle. I told the Husband once before we were married, “If I can promise you anything, it will be this – you will never be less than entertained.” Fun has always been our main focus. That is the goal of #vanlife. To enable us to do something actively fun everyday. To appreciate the simple things, and see the world for the beauty it is in its natural state. 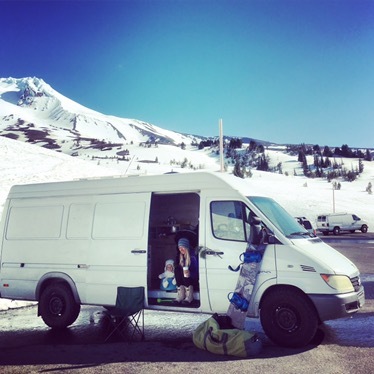 Baby knows no other home then this van that filled her first year with the sound of ocean waves, the scent of forest rain, the view of mountains, feel of clear warm water lakes, and the taste of fresh snow fall. 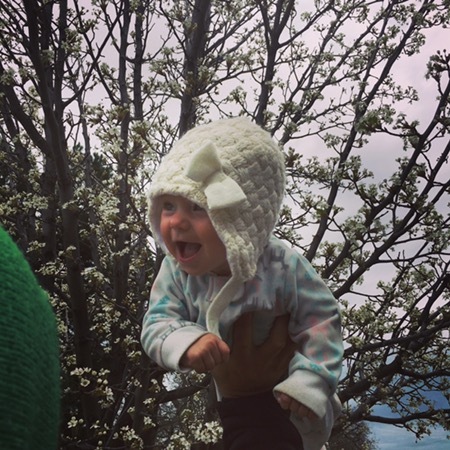 Adventure seeking will be her roots, and that is just fine with us.